Hanoi, Viet Nam, 2 March 2018 — Members of TRAFFIC, WWF, and the French Development Agency (AfD) held a workshop in Hanoi today to reflect on the achievements of their three-year project to curb demand for rhino horn in Viet Nam, and to discuss how the campaign will continue into the future. The event included around 40 representatives from government, civil society organisations, and others who contributed to the initiative’s success. 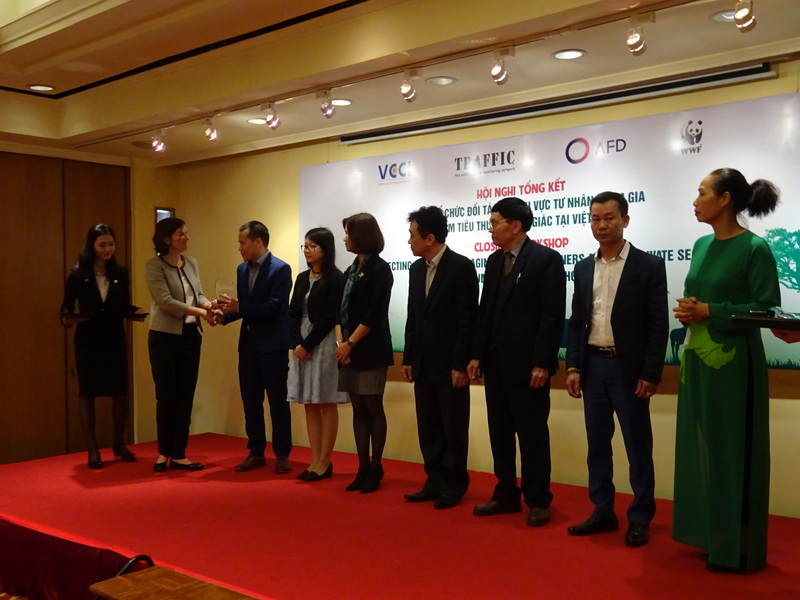 The project, titled “Protecting Rhinos by Engaging Civil Society and the Private Sector to Reduce Consumption for Rhino Horn in Viet Nam” encouraged civil societies to foster a zero-tolerance approach to illegal wildlife trade. Groups such as the Viet Nam Chamber of Commerce and Industry (VCCI), the Viet Nam E-commerce Association (VECOM), and the Viet Nam Automobile Transportation Association (VATA), Hanoi Association for Women Entrepreneurs (HNEW), Hanoi Young Business Association (HANOIBA), HTX Golf My Dinh either participated in or were shared document of training workshops to learn about how integrating anti-trafficking policies into their corporate social responsibility activities not only helps combat illegal wildlife trade but also showcases their business as a socially responsible entity, boosting their reputation. As a result of the participation of these organizations, more than 20,000 businesspeople have been trained on the merits of adopting anti-trafficking CSR activities since the inception of the project, including more than 5,000 women. The workshop featured panel discussions with business leaders who discussed how adopting CSR policies that promoted conservation benefitted the business community. Members of CSOs explained the importance of social mobilisation in effectively combatting wildlife crime. Virginie Bleitrach, vice-director of AFD Vietnam stressed on how to better support CSOs that want to adopt zero-tolerance CSR policies. “Vietnamese businesses and civil society organisations are emerging as leaders in the fight against the country’s illegal wildlife trade,” said Bleitrach. Over the past several years, Vietnam has emerged as a hot spot for rhino horn consumption as well as a transit hub for horn en route to China. To meet Asian demands, the poaching of African rhinos has increased exponentially over the past 10 years. In South Africa, home to most of the world’s rhinos, 13 rhinos were poached in 2007 compared with 1,028 in 2017, an increase of more than 7,800%. As the vast majority of these horns are headed to Vietnamese markets, reducing consumption within the country is essential to the survival of rhinos. Project representative is giving award to CEOs that are actively in encouraging their staff to not use rhino horn.